We arrived in Tanop on a Sunday afternoon – the small village where we intended to spend the next two weeks (or so) volunteering at the school started by the Singing Kites organisation in Australia. Where is Tanop? 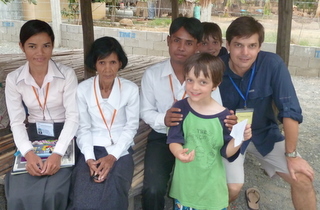 In Bati Province, Cambodia, about 1 1/2 hours drive from Phnom Penh … I can’t tell you anymore than that. So here we are in this quiet little village of 2,500 people … or so we thought. That was until the first truck filled with gravel rumbled past the road about 50 metres from the volunteers’ cottage. The large hill near the village is a quarry and all day from sun up to 9 pm or later at night we were to discover that the trucks and rock smashing machinery would provide us with constant background noise. This constant background noise is occasionally interspersed with explosions! We had no idea that explosions were part of the village’s everyday life so the first one we experienced whilst eating dinner obviously came as a shock! It was the biggest one we experienced in our time in Tanop and it actually caused the ground to shake! There seems to be no system or warning to the explosions either and many occured during school hours which would cause a stir amongst the students! Given that it is the dry season and it is already very dusty, the additional quarry dust is very unwelcome! During our time in Tanop we stayed in the volunteer cottage across from the school; a comfortable and good size room that housed the four of us; two large beds; a fridge/freezer; a couple of small tables and storage cupboards; a hanging rack for clothes and that’s about it. We cooked outside on a gas cooker and escaped the heat under the fan, on the verandah or in the Cambodian style pergola house. 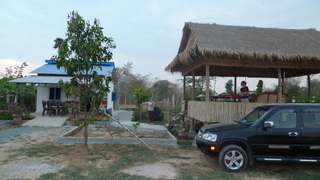 The volunteer cottage and Cambodian bungalow at TCEC. Our diet consisted of rice, rice, spaghetti, pasta, pasta sauce, tinned corn, tinned tuna, tinned peas, tinned lentils, tinned fruit, long life milk, eggs, some bread and jam and supplemented with fresh bananas, watermelon, mangos and coconut. Simple, easy to cook food that filled the gaps in our tummies! Needless to say I am glad to have a break from cooking and washing up again. We had a small shower and Western style toilet in the building behind the cottage. Every day we would fill up the two camping shower bags so that we could have hot water for a shower; which was not ususally hot when went would go to use it - but who needs a hot shower in 35 degree heat anyway! The toilet was flushed by filling up a large scoop and emptying into the toilet bowl. Toilet paper went in a brown paper bag for burning. Daily chores included burning rubbish; filling water containers and shower bags; sweeping dust and more dust; soaking clothes in a bucket overnight for washing in the morning; rinsing rice to eliminate the extra protein(! ); ensuring water bottles were filled and placed in the freezer throughout the day to keep us all hydrated; thinking of creative meals with limited ingredients and tending to children. But that is not why we came to Tanop! We came to volunteer at the school. We didn’t really know what that would mean until we got there and started. For 10 days we attended the school (Monday to Saturday). We would start at 7.30 am and take turns teaching different classes and caring for our own children until the last class at 7.30 pm. The school has three sessions. First session from 7.30 am until 10am. This is followed by a 3 hour break until teaching resumes at 1 pm. This break time was fantastic for getting all our chores done and having a rest. 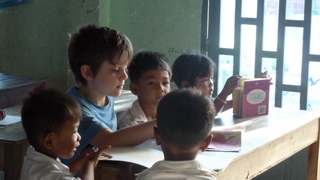 Harris and Patrick would escape to the Cambodian bungalow with their homework or iPods. Back to school at 1 pm until 3 pm and then a rest until 4.30 pm. The last session would end at 7.30 pm. A really long day! So what did we do at school? I attended the preschool class every morning for the 10 days which I thoroughly enjoyed. I had the opportunity to teach them the hokey pokey; heads, shoulders, knees and toes; read ‘I Went Walking’ and ‘The Very Hungry Caterpillar’; and had them all huffing and puffing and blowing down houses in ‘The Little Pigs’. They were a gorgeous little group of 3-6 year olds with a very dedicated young teacher who I saw grow in her skill and confidence before my eyes. Harris was a great help reading to them and joining in my aide when required! They loved chasing Harris when he would ride a borrowed bicycle during their outside play time. In the middle session we both taught classes of students aged 8-12 years. Hangman was a hit and I am sure that their teachers will have to continue playing this game forever more. Another game that was hugely popular, which I used to teach them to recognise spoken and written numbers, was were everyone would stand up and have to form a group of people the same size as the number I requested. It was absolutely hilarious to see their delight in recognising a number and then trying to scramble and pull or push people away to make the correct number in their group. This was obviously not a quiet game! I also taught them ‘the wave’ so the group that won the most points in my pop quizzes got to celebrate! Steve spent a lot of time with the older students and had a favourite evening class. The evening classes were lovely. Cooler time of day, dedicated students and very keen to practice their good knowledge of English. The teachers were fantastic. What a dedicated bunch of teachers working long days within a long week. Many of the teachers were also continually working on their own English proficiency and attending classes and studying English in their ‘spare’ time. The teachers didn’t just teach; they filled water containers; dug and watered garden beds; tied down shade cloth onto the new bike shelter and many other extra jobs at the school – definitely a labour of love. We feel very priviledged that we were able to attend the school and share this amazing experience as a family. Whilst it was challenging and exhausting to volunteer our time to the school whilst attending to the needs of our own two children, we would certainly do it again. As a school nurse I have thoughts of returning to screen hearing and vision one day and teaching dental hygiene and nose blowing. I think any time that other keen volunteers could donate to the school would be valuable e.g. teaching internet skills to the teachers; cataloging books for their planned library or maintaining resources. The teachers would no doubt appreciate any assistance and the students benefit immensely. We had a small farewell on our last night and on the Friday morning the teachers came to the cottage to send us off. So many of the students and the teachers have made their way into our hearts. Thank you to Lyn Hotchin for all her wonderful work in setting up Singing Kites and TCEC. We are grateful for the opportunity to come to Tanop and are proud to call you a friend. See you back in Highfields in the new year! I am so glad that your time at the school meant so much to you! 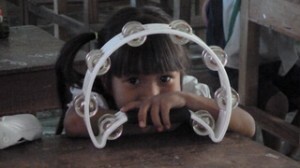 It is a very special place, and the children, and teachers are impossible to forget! Thank you for sharing your time with us, and for helping to make so many children happy! It will mean a great deal to all of them there. As you realize, it has opened up their world, having us as part of their lives. They live an isolated life, but are warmed by our volunteers, like yourselves, who offer their time so unselfishly. THANK YOU for sharing time with us! See you on your return in 2012. Thanks Lyn. Catch up soon. What an amazing experience for you all. Patrick, I loved your drawings. Your diet sounds like what we lived on in Karumba for four years! Hi Guys! Our minds boggle at the opportunities you are experiencing, and the possibilities that coul be created rom that. It must have been su fulfilling to have engagedin such an event as being part of the school life. What an amazing developmental educational experience for the boys as well. Dad’s trip is in planning and prep stage now since the positive report last week. Howdy Neighbors,Well, Despite the dust ,explosions ect. what you are doing is a wonderful thing. I’m sure the children will always remember you. The heat is something else isn’t it? (wish it was something else… like cool)I found it almost unbearable in Thailand. Looks like you are all having a great family experience, that YOUR two little will always treasure. All is o.k. here, your house is still where you left it. Hugs to all, CARRY ON DOTS. This is Michelle, from Barcelona. 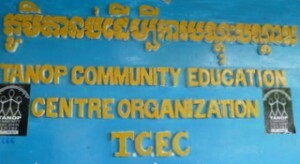 I will be heading to Cambodia myself in the middle of December and would love to volunteer here for a week. Would it be possible to connect me with Lyn so I can get more information? This sounds like a fabulous way to get to know people in Cambodia. I will send you the details for Singing Kites. Good luck with your journey.